This is the launch email sent out by Carol Walsh to all former students who attended the 2010 Reunion in Gander. It has been almost two years since the Reunion and your Organizing Committee has continued to meet on your behalf to plan and organize the legacy that was presented to you during the reunion weekend. 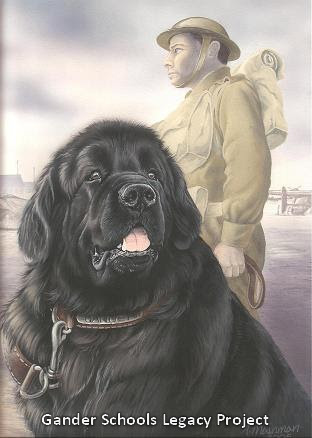 Erect a lifesize monument of the Newfoundland Dog, "Gander", together with his soldier handler. Restoration of the present cenotaph, "Winged Victory". Renovate and revitalize the site to a park setting, now known and sanctioned by the Town of Gander as the "Gander Heritage Memorial Park". Relocate the 125th Squadron Wall of Honour previously located at the Gander Aviation Museum to the new Park. Erect a low granite wall of honour to bear commemorations and tributes to Gander’s historical past, i.e. Ferry Command, air disasters, etc. Install paved walkways adopting the direction of our runways. Install lighting, seating, foliage, etc. The renovation and restoration of the site was determined in consultation with the Royal Canadian Legion who bought our attention to the deteriorating condition of the present monument. In addition, wrought iron fencing was rusting, walkways and sidewalks had weakened and the site was depreciating each year. The site, however, is beautiful with mature evergreens and other shubbery and is situated in the heart of the Town. The Committee decided to extend the scope of our original plan (which was to place the monument of "Sgt. Gander" on the site). We accepted the challenge of providing the Town with a "Park", a place of quiet solitude and peace, commemorating our aviation and wartime history. So was born the "Gander Heritage Memorial Park". Much work has already been completed. The volunteered services of a landscape architect has provided us with all our landscape planning. The architect has worked with a local firm who has also volunteering their engineering services to plan and oversee the groundwork for the project. Also, a local contractor has offered to provide heavy labour and equipment assistance. We are very fortunate because these services would have been very costly to employ. The Town of Gander removed, crated and transported to storage the Airmen's Wall of Honour which was previously located at the North Atlantic Aviation Museum. We provided assistance overseeing this move and also stood to the cost of some of the expenses incurred. This move was necessitated by a request from the Museum who felt that the Wall was not within the parameters of museum collections but was more allied with heritage and war memorials. We have presented our plan to the Town of Gander who are in complete support and are providing assistance wherever possible. Indeed, monies collected in the way of donations to the project is being managed by the Town who will issue tax receipts, etc. In addition, the Royal Canadian Legion have pledged their support and are working with us on this project. We are now ready to proceed to our second phase. We have recently welcomed a visit from a well known Newfoundland sculptor who surveyed the cenotaph area and discussed in detail the proposed monuments. We are consulting with a major fundraiser of a similiar project here in Newfoundland and the Committee has visited this site. This phase will also see accelerated fund raising. We have determined that the total cost of the completed project will be in the vicinity of $350,000. We are pursuing all avenues of funding through a number of federal and provincial grants, local service clubs, and other means at our disposal. This second phase will include removal of the present angel "Winged Victory" in November of this year and arrange to have it transported to the sculptor for restoration. Ground work to renovate the park area will have been completed to accommodate its return by the spring of 2013. Our presentation recently made front page of the Gander Beacon who has published a number of items regarding this project. Our Chairman, Wilson Hoffe, has been interviewed by radio and television about the project. This is a challenging venture but we are pleased with our progress to date. The undertaking will take a couple of years to become reality. Although many of you are not now residing in Gander, we truly hope that as former residents of Gander and former students of Gander Schools, you will take great pride in this project and hope that it will be a place to visit when you return. Your support, views, comments and suggestions are welcomed.